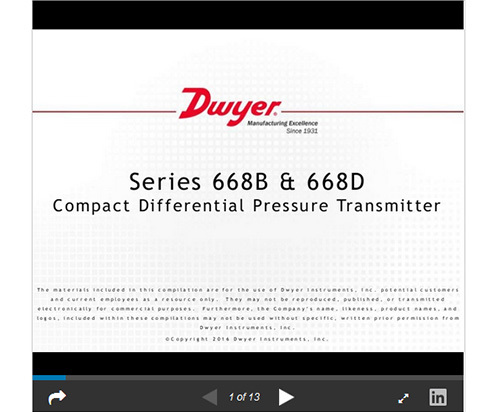 Our low cost SERIES 668B/D Compact Differential Pressure Transmitters are capable of sensing differential gage pressure with ±0.8% FS accuracy, and converts this pressure difference to a proportional high level analog output for both unidirectional and bi-directional pressure ranges. These transmitters can withstand up to 15 psig overpressure with no damage to the unit. The compact, lightweight design makes installation simple and easy. 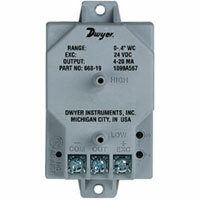 Units are protected against incorrect wiring, and include a protective terminal cover. Operating: 0 to 170°F (-18 to 77°C); Storage: -40 to 185°F (-40 to 85°C). From 40 to 170°F (4.4 to 77°C). 4 to 20 mA (2-wire), 0 to 10 VDC (3-wire), or 0 to 5 VDC (3-wire). Accessible under the small terminal cover. 3/16" OD barbed brass for 1/8" ID push-on tubing. Stainless steel and PC+ABS alloy, UL 94 V-0 rated. 19 0 to 0.1” w.c.